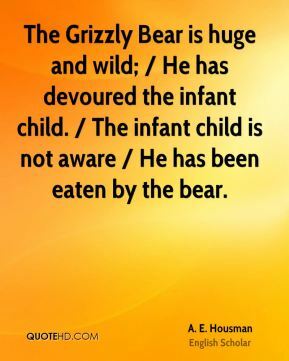 The Grizzly Bear is huge and wild; / He has devoured the infant child. / The infant child is not aware / He has been eaten by the bear. 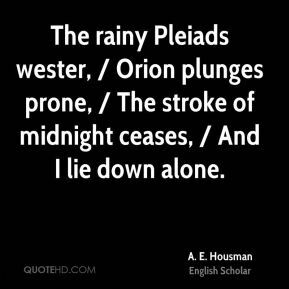 The rainy Pleiads wester, / Orion plunges prone, / The stroke of midnight ceases, / And I lie down alone. 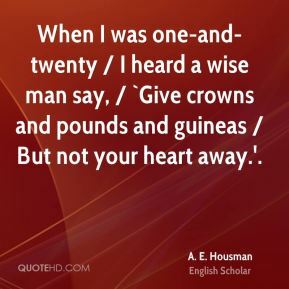 When I was one-and-twenty / I heard a wise man say, / `Give crowns and pounds and guineas / But not your heart away.'. 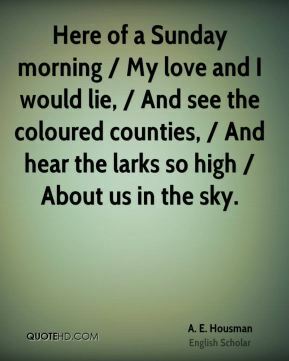 Here of a Sunday morning / My love and I would lie, / And see the coloured counties, / And hear the larks so high / About us in the sky. 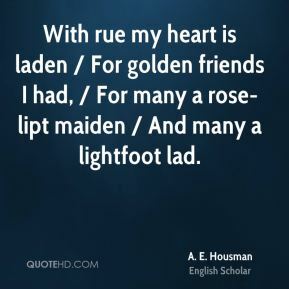 With rue my heart is laden / For golden friends I had, / For many a rose-lipt maiden / And many a lightfoot lad. 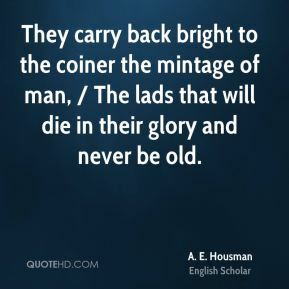 They carry back bright to the coiner the mintage of man, / The lads that will die in their glory and never be old. 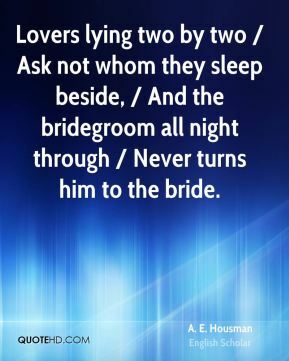 Lovers lying two by two / Ask not whom they sleep beside, / And the bridegroom all night through / Never turns him to the bride. 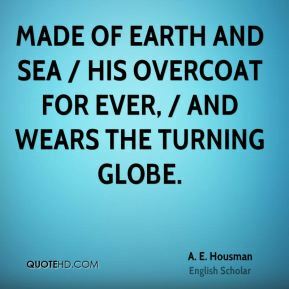 Made of earth and sea / His overcoat for ever, / And wears the turning globe. 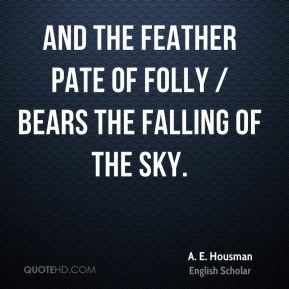 And the feather pate of folly / Bears the falling of the sky. 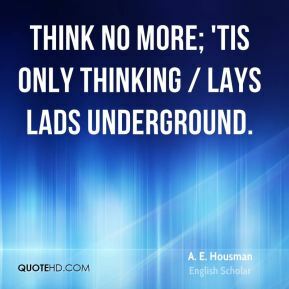 Think no more; 'tis only thinking / Lays lads underground. 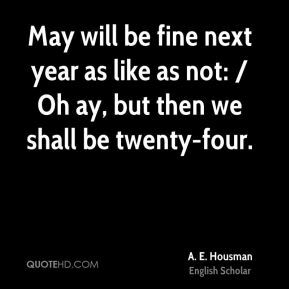 May will be fine next year as like as not: / Oh ay, but then we shall be twenty-four. 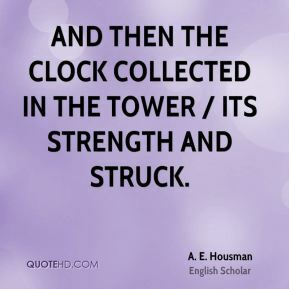 And then the clock collected in the tower / Its strength and struck. 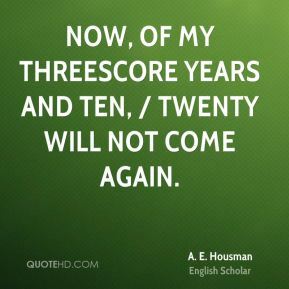 Now, of my threescore years and ten, / Twenty will not come again. 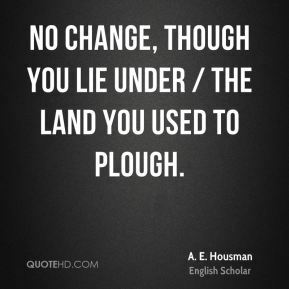 No change, though you lie under / The land you used to plough. 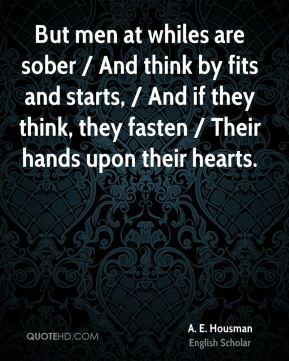 But men at whiles are sober / And think by fits and starts, / And if they think, they fasten / Their hands upon their hearts. 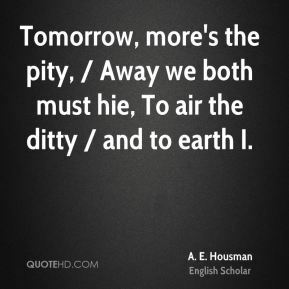 Tomorrow, more's the pity, / Away we both must hie, To air the ditty / and to earth I. 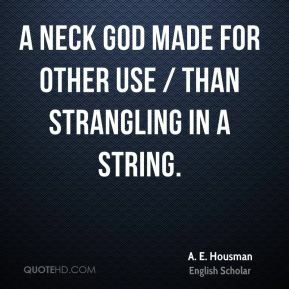 A neck God made for other use / Than strangling in a string. Cambridge has seen many strange sights. 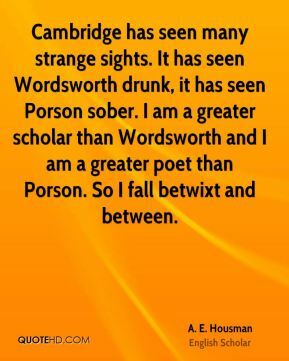 It has seen Wordsworth drunk, it has seen Porson sober. 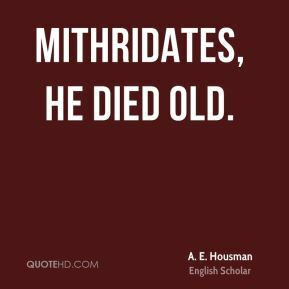 I am a greater scholar than Wordsworth and I am a greater poet than Porson. So I fall betwixt and between. 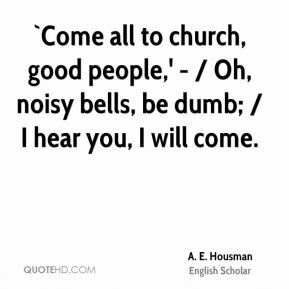 `Come all to church, good people,' - / Oh, noisy bells, be dumb; / I hear you, I will come. 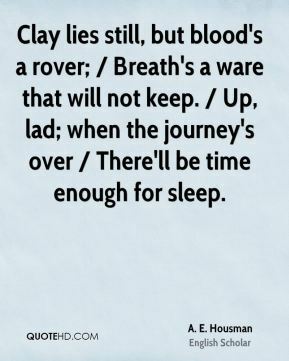 Clay lies still, but blood's a rover; / Breath's a ware that will not keep. / Up, lad; when the journey's over / There'll be time enough for sleep. 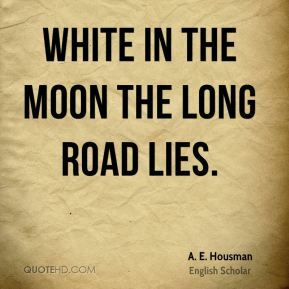 White in the moon the long road lies. 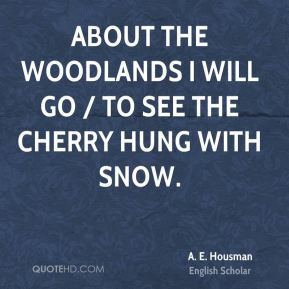 About the woodlands I will go / To see the cherry hung with snow. 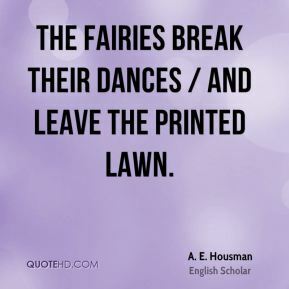 The fairies break their dances / And leave the printed lawn.